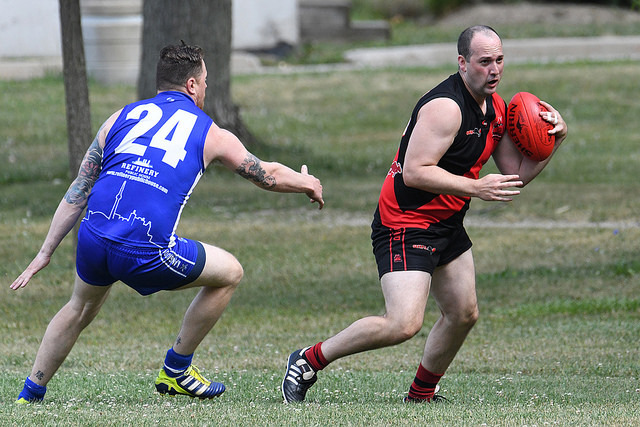 The first round of AFL Ontario finals for 2018 played out over the weekend on a cracking day at Humber College South. For and against broke the tie between the Hamilton Wildcats (5th) and the Toronto Dingos (6th). So it was that the Dingos found themselves facing off against the Etobicoke Kangaroos (3rd) for the right to keep their hopes of a flag alive. The two teams had last faced off back in round 8, with the Kangaroos coming away the victors 9.17-71 to 7.6-48 after a big fourth quarter push. After a big recruiting push going all the way back to Australia day 2017 Dingos coach Mike Karas had plenty of troops at his disposal, enabling the Dingos to field one of their strongest teams of the year. It was also great to see so many alumni, friends, and family down at the game to support. Tom Bell reprised his role in the ruck, providing some much needed physicality, and was well supported by John Curtin and Stefan Cosma. The Dingos took advantage getting early ball down to Rob McNaughton resulting in two early goals to get things pointed in the right direction. Harris responded for the Roos with a long range kick over the defense bouncing through and reminding all concerned that this would be a tough contest all day. On the day it was Ben Moller in the hot seat at fullback, doing his best work to contain with support from Patrick Bossey and Greg Gilbert. Supporting McNaughton in the forward line was Thomas Santibanez-Espinosa again at his athletic best and good for two goals for the trouble. At the half-time break the Dingos were up, but knew from the previous meeting of the two teams that there was plenty left to do if they wanted to prevail. In the premiership quarter things started out slowly but the Roos managed to turn on the consistent offensive pressure and with getting the ball through the wings suddenly a struggle the Dingos began to fade. Heading into the fourth things were still not beyond reach though. The Dingos managed to slow the tide adding a couple of goals late for McNaughton and Cosma but in the end had left themselves too much to do in too little time. The Roos ultimately running out the victors 11.7-73 to 8.7-55. Juston Powick again provided much needed spark out of the half back line with his ability to quickly play on but it was Stefan Cosma was best on ground for the Dingos driving a lot of the attacking footy down the ground and into the 50 on the day. All in all the Dingos will still take a lot away from the season, having come from a wooden spoon in 2017 to competing in a finals match. A big congratulations must surely go out to all who stuck it out and returned as well as the many new faces who improved with each and every game. Attention will now turn to organizing the Dingos’ 23rd Annual AFL Grand Final Party at The Office Pub on John St. For more info on what is sure to yet again be a hugely popular event head to http://gfparty.torontodingos.ca/.